It looks like economy is a gamble. A gamble in which those are winning who have enough already – the ‘big players’, multinational companies and coperations. 500 of them are ruling more than 52 percent of the gross world product. The stabilization of this uncommonly concentration of power inter alia dues to the fact, that the capitalistic system knows how to keep itself running with diverse and sophisticated mechanisms, hidden to individuals. It is almost essential for this “machinery” that individuals are not able to see the bigger picture and be a small cog in a big machine. Like a hamster in a wheel. 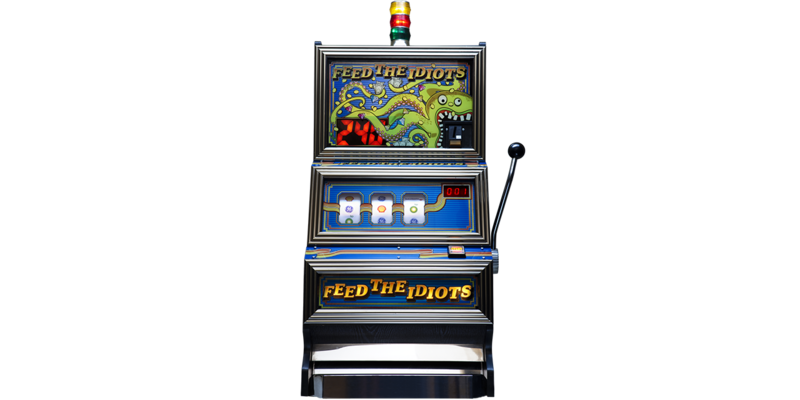 FEED THE IDIOTS is a modified one-armed-bandit gambling machine and promises the same as a common slot-machines promises: “You can win!”. The aim of the simplest form of a one-armed-bandit game is to be lucky enough to get the same symbols three times in a row. The difference with FEED THE IDIOTS is, that the usual fruit-symbols are substituted by logos of international companies, like Santander, Unilever or BP.